Click here for information on getting signed books! 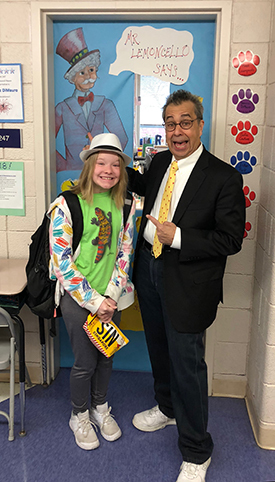 For the 2019-2020 school year, J.J. & Chris Grabenstein have put together a brand new, extremely interactive (and fun), in-person presentation to go along with the first book they've co-authored together, Shine! Using their improvisational comedy skills and collaborative writing prompts, they talk about working together (and with their editor) to create Shine! They will then work with your students to collaborate on a brand new story, created right on the spot. 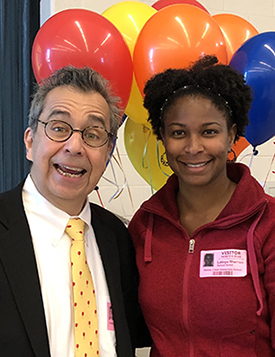 Chris & J.J. are also available to visit schools in the New York City/Tri-State area only (reachable by train or car service) during the months of January, February, & March 2020. For those months, please contact their assistant, Latoya Sherron. In April, May, and June 2020, Chris will be able to travel outside the tri-state area (J.J. will join Chris, at no extra cost, whenever possible). Chris can do the "SHINING TOGETHER" presentation by himself with the assistance of a teacher or librarian. Priority will be given to schools planning a major event (such as a one-book, one-school project) around Shine! If you're interested, please contact Latoya. 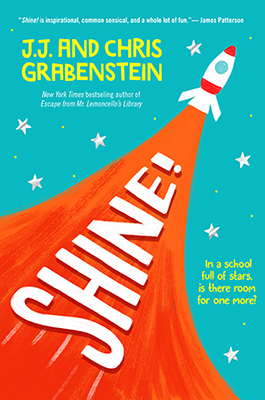 These visits are FEE FREE for schools that purchase at least 100 copies of Shine! 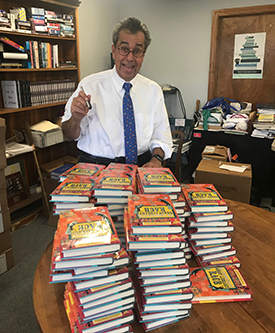 (Chris is happy to sign his other books as well as those he has co-authored with James Patterson but those books will not count toward the 100 minimum.) Schools also need to pay reasonable transportation and, if out of the New York City metro area, lodging costs (just for Chris; if J.J. is not in the recording studio and able to travel, she's a free bonus!). 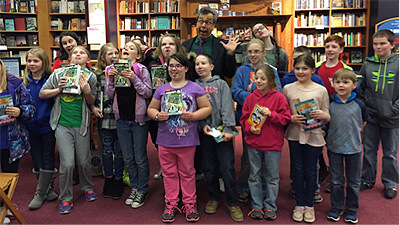 Chris and J.J. encourage schools to work with their local bookstores whenever possible. Many of those stores offer schools discounts when they order mass quantities of a title. If that option is not available to you, Random House Children's Books offers schools a discount on books purchased for an author visit. Designed for grades three through six, a typical session runs 45-60 minutes with time for questions. 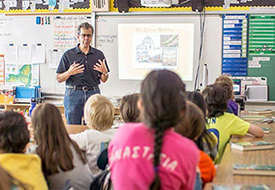 Chris and J.J. can do two assembly presentations plus one writer's workshop per day. 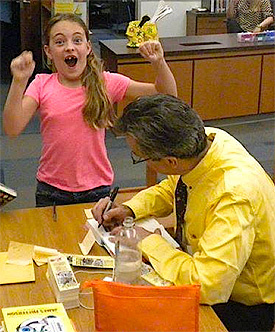 They are also happy to do a lunch with students and/or faculty and, of course, do a book signing. Latoya helps keep Chris super organized! A room, auditorium, or gym full of eager, well-prepared students. An LCD projector (VGA or HDMI connection) and screen or ginormous TV screen/Smartboard. Computer speakers. A white board or flip chart with markers. TWO excellent microphones (no matter the size of the venue) —handheld is best (either corded or wireless). Two bottles of room temperature water (Read Shine!, you'll understand). A writer's workshop works best with 25-30 highly motivated students eager to write. (Many schools host an essay writing contest to pick the participants.) 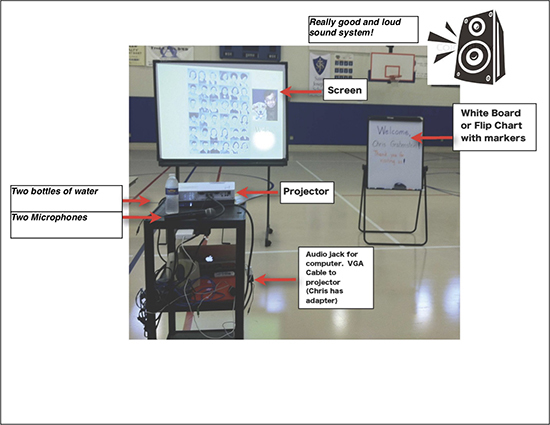 For that session, all that is needed is a projector or smart board that can be connected to a computer. Will this be a "one book-one school" or similar major event? What grades would Chris and J.J. be talking to? Please confirm that you can meet Chris's AV requirements. How will the teachers incorporate Shine! into their classroom lesson plans prior to the visit? Do you have a local bookseller that you work with for book orders when hosting authors? Is it possible to get to your location via train or direct air flight? 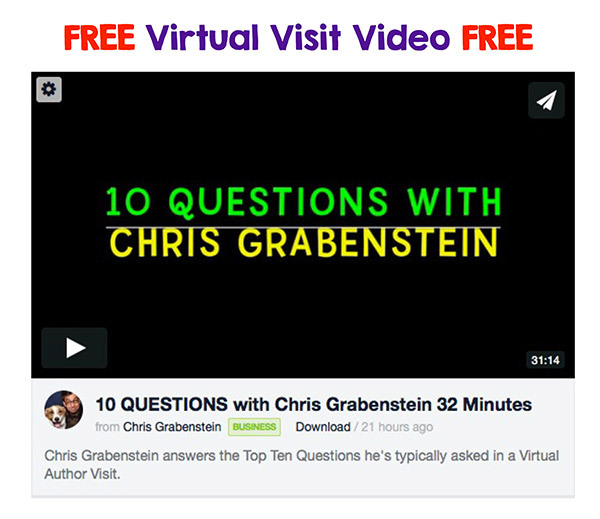 Chris loves making virtual visits to classrooms that have read at least one of his books. 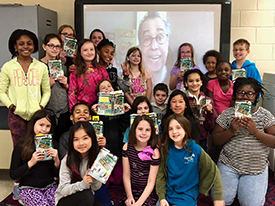 If you're a teacher/librarian and your class/school has been reading something by Chris, just e-mail his assistant Latoya Sherron (contact@ChrisGrabenstein.com) to make all the arrangements. It's Fee Free! Skype sessions usually last about thirty minutes and work best when the students come prepared with questions. 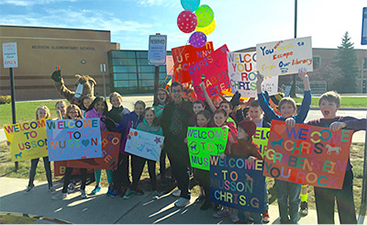 Which of Chris's books will your classroom, school, or group have read prior to the visit? How many students will Chris be talking to? What grades will be represented? Latoya can also provide you with a link to a FREE 32-minute video where Chris answers to The Top Ten Questions he is typically asked during Skype sessions. Library Olympic Games! 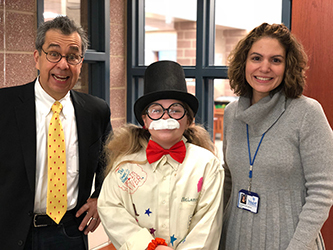 Chris has also created a second FREE video where he is the Lemoncello-esque "game show host" for some Library Olympics games that you can play in your library or classroom. Just click the link and let the games begin! 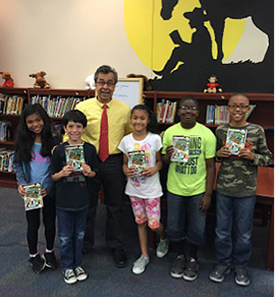 "I have been a teacher and principal for 35 years and I have seen many author presentations. 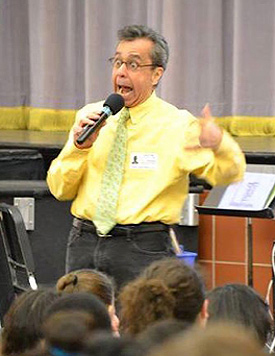 Mr. Grabenstein's presentation was by far the best that I have ever seen. He truly engaged the students during the presentation and motivated them to read and write. His charm, wit and sincere joy emanated throughout the presentation. How could one not be captivated while listening to his stories and ideas?" "All I can say is WOW! Chris Grabenstein's presentation was fabulous. The kids are still (4 hours later) all abuzz about it. In my many years of being a librarian and having guest authors, this was by far the best. Thanks again." "Both the students and the teachers truly enjoyed your presentation. 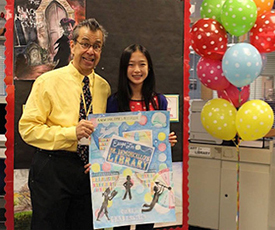 In fact, a few of the teachers even commented that it was the best author presentation that they had ever attended." 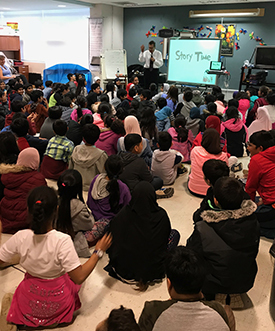 "I have never received so many compliments from teachers, (in 7 years of doing 2-3 assemblies each year), who are also saying their students were enthralled by the assemblies. The real music to my ears, though, is from the not-so-enthusiastic young readers, who are stopping me to tell me, "I am already on chapter six in my book!" Could I have some of your magic, please? Aside from this, you are one of the nicest people I've ever met! Which is also what I'm hearing from everyone else! Seriously, it's not just that everyone is SAYING you were wonderful...they are saying it with great, happy facial expressions, confessions of being inspired to write, and much thankfulness for a terrific experience. I am lucky to have stumbled upon whatever brought you to my attention!" 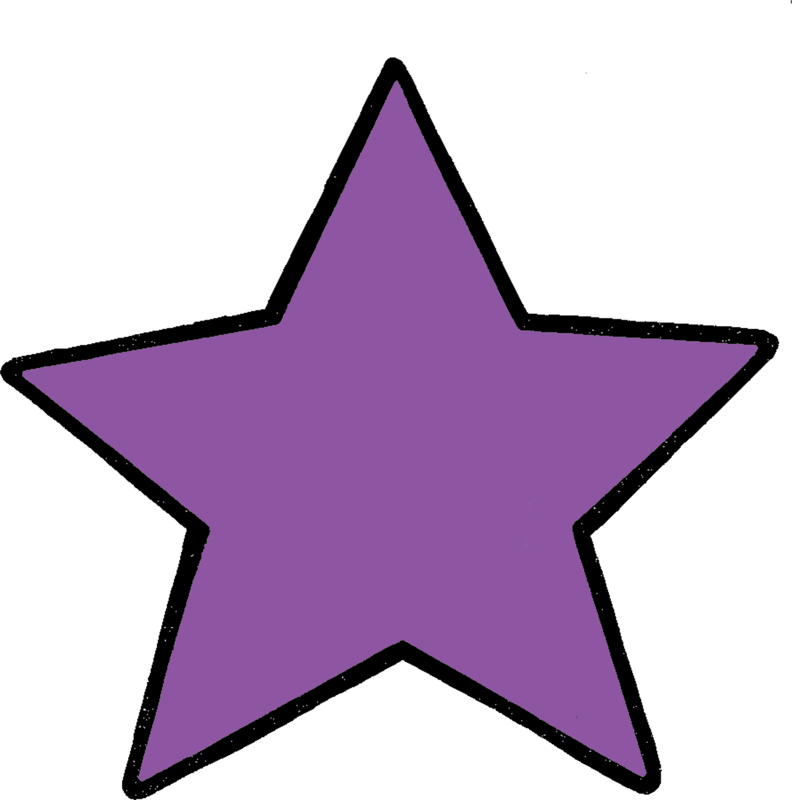 "The students and teachers all raved about your presentation. 'Awesome!' 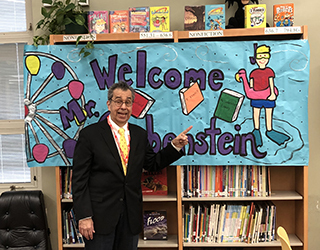 'Best author visit we ever had!'" "Thank you for the wonderful presentations today! 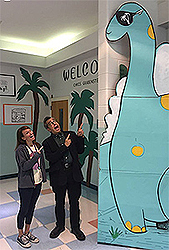 I can't tell you how many students said, 'He was the best author visit yet!'" "You held the audience captive with your insights, instructions, suggestions and your talent. As I said before, if you choose to embark on another career, teaching would be blessed by your presence." Order books for the visit from your local Independent Bookstore, many of which offer discounts to schools. For some great tips on planning a successful school visit please visit the Random House Teachers page.